​Our farm consists of La Mancha dairy goats (to which the maremmas have their primary responsibility), Peruvian horses, rescued Greyhounds, bees, garden, and other typical farm animals. My educational background is BS in Business from Arizona State University, and a MBA from Thunderbird School of Global Management. I am currently employed with contract Program Management Office oversight, managing IT, acquisition and accounting projects. And I am a certified project manager, Project Management Professional (PMP). My wife and I actively work the farm in addition to our professional responsibilities. 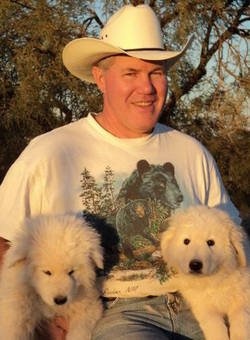 ​Our family initially acquired our Maremma breeding pair for livestock protection. We became breeders after the primary breeder in our state relocated. Our pair has produced multiple litters. We have placed pups from Maine to California, Idaho to Arizona. We love the breed for their intelligence and friendliness, while also appreciating that they can become aggressive protectors when needed. ​Because of the affection I feel for my dogs, I want to encourage the highest standards for the well-being of them and the promotion of the breed. We are often talking about the breed and as a result, have not only educated many people on this exceptional line of canines, but have made a few customers along the way. ​If elected, I will provide help to the club in the highest capacity needed.